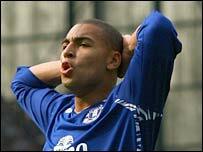 Everton fear striker James Vaughan is facing a two-month lay-off after dislocating his shoulder. Vaughan, 19, suffered the injury after an innocuous collision with Preston defender Youl Mawene in Wednesday's pre-season friendly. The injury will rule Vaughan out of Everton's tour of the United States and the start of the Premier League season. Assistant boss Alan Irvine told Everton's website: "I would think he will be out for a couple of months." Vaughan needed extensive and lengthy treatment on the pitch before being taken to hospital. The England Under-19 striker will undergo a scan on Thursday and Irvine added: "Having suffered the injury myself I know how painful it is and how long it can take to get back. "It's not a long, long term problem like a knee injury but it's not something we can expect him to return from in a matter of weeks." Vaughan has been dogged by injuries during his short career. After bursting on to the scene as the Premier League's youngest scorer, he missed most of the 2005-06 campaign with a knee injury and last season he severed a leg artery in the draw with Bolton in April. Irvine said: "It's bad luck for him. After being out for so long he did really well at the end of last season and he was looking good in pre-season."